This is plate 7 from James Fergusson's 'Illustrations of the Rock Cut Temples of India'. This late-5th century vihara (Buddhist monastery) is one of the most impressive at Ajanta. A hall with octagonal columns leads directly to a shrine containing an image of a preaching Buddha seated on a lion throne. The front columns are elaborately carved with scrolls and floral motifs; the brackets are adorned with celestial couples. The cave has fine paintings including scenes taken from the Buddha's early life. 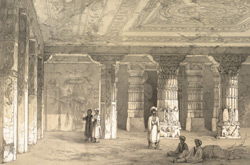 James Fergusson, studying the architecture of the caves, felt that they possessed to an European public, "an interest which it would be difficult to excite for other works, without a more extended history of art in the East".